Did Nintendo do a solid remix to Mario in Paper Mario? Before I think I had mentioned in a previous post about Kotor 2 or Kingdom Hearts being my first role playing game, it was actually Paper Mario. At first glance this game seems very silly and looked like a bad remix of the classic super mario bros. But I took a chance and bought the game. I’m glad I did 😀 this game was nothing like I expected from a traditional Mario game. I mean after seeing Yoshi Story, baby mario, mario kart, golf and tennis. I really thought Nintendo was running out of solid innovative ways to keep Mario alive. But in this game you actually have Mario partnering up with typical “bad guys” to beat Bowser. Even your first companion in the game is a Gomba. Things that you utterly hated when you were at the end of a level and they end your lucky winning streak. But in how this was set up it was a typical mom, pop, son daughter, grandparent atmosphere. And even went the distance of saying this gomba or “Goombario” is one of Mario’s biggest fans. Even through the rest of the game all the typical “bad guys” of Mario are seen in a different light in this game which really gave a nice spin on things in the Super Mario Universe. 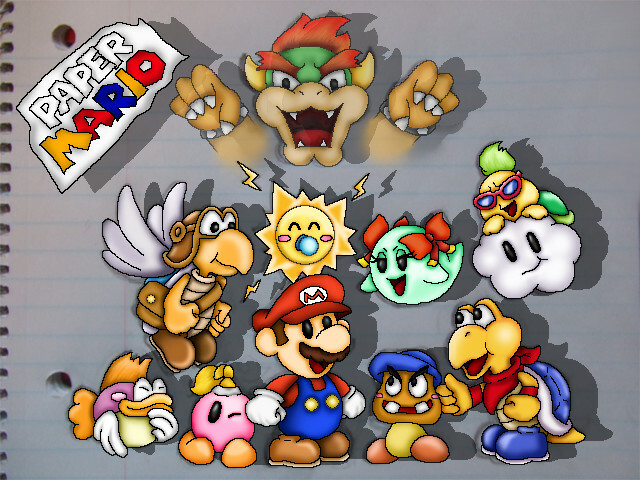 By far Paper Mario is in my opinion of the most innovative mario games I’ve played. Yeah there’s the galaxy games but I think the Paper Mario platform really let the developers have fun with this for anything new was welcomed. As for the tradition Mario be it a 2D game or 3D you’re still limited to nearly the same powers Mario had since super Nintendo. Well let’s be real about it, Mario is that childhood game that got started in your gaming career. Most parents wouldn’t approve of shooting games for little kids, (looking you call of duty). So Mario by parent demand, is more so for the parents than the kids. Anyways back to the game. The battle system of this game was rather simple to use and enjoyable. This was the first game I played that I had to take turns attacking. Everything I did was in real time like Star Fox 64. The power ups, story line and the music…omg the music dude. The music on this game is so underrated. But I’ll get to that in minute. I’m not going to cover the storyline to much but The Star Spirits who grant people’s wishes through the Star Rod get’s attacked by Bowser and steals the Star Rod and imprisons the Star Spirits. And as for princess peach you already know what happens to her so I’m not gonna talk about that. All the same, we are happy we have good reason to go on another adventure outside of trying to save princess peach….again. But what I liked most about the game was innovation that was put into this game. From the interactive environments and stage like environments. You had to actually have some sort of strategy to sometimes defeat your enemies. I’m only saying this for kids in between the ages of 8 and 12 only think so far into the future. Music wise this game was memorable. For starters I’d have to say shooting star summit, master battle theme, and walking in the clouds were my favorite songs. I’d like to hear from any of you if you have any favorite songs from Paper Mario. Luigi had a journal in this game and he mentioned going on his own adventure one day. And that adventure was Luigi’s Mansion. Overall this game was pretty solid and had some replay value as well. And again I have to stress that the whole feel for the game was a nice break from he typical games we play from Nintendo. There are sequels to Paper Mario but it seems after the thousand year door sequel I’ve heard bad reviews. I do hope Nintendo keeps Paper Mario going but stick to its roots in the first two installments of the series.